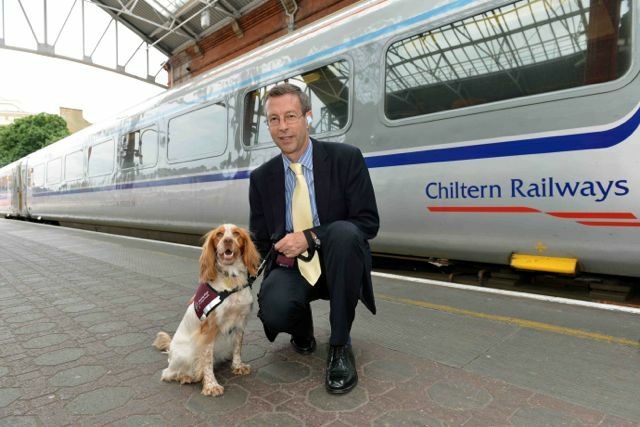 National charity Hearing Dogs for Deaf People has challenged the Managing Director of Chiltern Railways to go deaf for the day to experience the train services his company provide first-hand, both with and without the support of a hearing dog. In a brave experiment, MD Rob Brighouse agreed to have gel moulds inserted into his ears by an audiologist at Specsavers Hearing Centre, which gave him a temporary 60% hearing loss. Immediately, Mr Brighouse experienced the sudden effects of deafness and was left feeling isolated and out of control. Rob quickly learnt that he would need to rely on lip-reading to communicate, but struggled with conversations especially if people turned away whilst talking to him. Rob also realised how challenging it can be to cross the road, find the right train platform and buy a train ticket. But everything changed when Rob was given hearing dog Rosie, who not only alerted him to important sounds around him, but most importantly she made him feel visible and brought him back into the hearing world. Every day in the UK, over 10 million people with hearing loss are faced with the communication barriers and isolation that Rob experienced. Chiltern Railways have been working with Hearing Dogs for Deaf People for the last year, and recently chose Hearing Dogs as their Charity of the Year. Text Donate: Text HDOG05 to 70070 to donate £5. Be the first to comment on "Chiltern Railways Managing Director goes deaf for the day"